for $825,000 with 4 bedrooms and 2 full baths, 1 half bath. This 5,879 square foot home was built in 2015 on a lot size of 1.83 Acre(s). 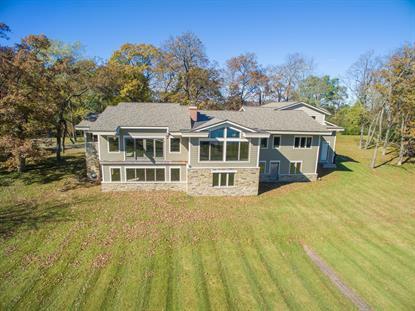 Multi-level home situated on the shores of Middle Genesee Lake, has approximately 5800 square feet. The interior does not have any finishes...no electric, heat, or plumbing. It is a blank slate that offers amazing views! Current floor plan shows an open concept kitchen, dining and lake room with natural fireplace & vaulted ceiling with sliding glass doors. Master suite with WIC, spacious bath with 2 vanities, water closet, tub and separate shower. Main floor also has a powder room, large mud room with laundry, plus a 2nd bedroom suite with 2 closets and private bath. Bonus room above the garage. LL floor plan was not finalized but it has a wall of full size windows and 2 exterior doors. It is large enough for 2 or more bedrooms, etc...also has a NFP.